Download: data (in .zip file with .pdf manual). ADD: Pre-loaded on storage media you've already selected to be shipped with this order. Players include Joe Fuentes, Derek Negron, Phil Retamoza, Michael Spiro, Rich Kuhns, Phil Hawkins, and Tango specialist Sebastian Rosenfeldt. 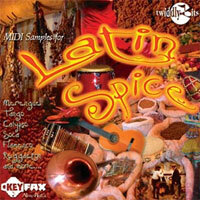 A huge collection 'Latin loops'. From sensual Argentinean Tango to the smooth Chachachas of New York's Puerto Rican barrios, from the contemporary hybrid Reggaeton to the ancient Rhumba Guaguanco of Reparto Marti in Cuba, from the playful Merengue of the Dominican Republic to the party-inspiring Calypso of Trinidad, and much more. Instrumentation comprises a large number of drum & percussion loops plus basslines, guitar strums, brass stabs, steel drums, accordion and more. The collection is organized into12 folders of parts that relate to that style. So, Tango offers contrabass, piano, and bandoneon while in Merengue you'll find drums, percussion, bass, accordion, sax etc. ©2016 Keyfax NewMedia - All rights reserved.